Barbara and Richard Mearns are British naturalists who have pursued their life-long interest in many parts of North America and Europe. They began their joint writing career by delving into the history of ornithology: celebrating the lives of hundreds of naturalists in Biographies for Birdwatchers (1988), Audubon to Xantus (1992) and The Bird Collectors (1998). In John Kirk Townsend, Collector of Audubon’s Western Birds and Mammals (2007) they focused their attention on just one person, whose contribution to the development of zoology in North America has never been fully appreciated. The breadth and scope of their previous research on both sides of the Atlantic gave the Mearnses a unique perspective from which to assess Townsend’s importance and his relationships with eminent contemporaries such as Thomas Nuttall, John Bachman, the Baird brothers and John James Audubon. For 20 years (1997–2017) Barbara was Editor for A Rocha, an international Christian organization which engages communities in wildlife conservation. She visited teams working to protect key sites such as dry coastal forest and coral reef in Kenya, Atewa rainforest in Ghana, Aammiq Wetland in Lebanon, Alvor estuary in Portugal and salmon rivers in western Canada. 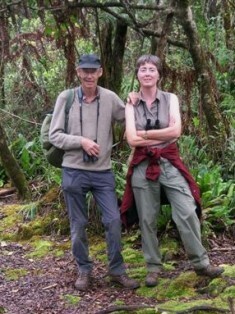 On retiring, she contributed ‘Motivations for conservation − a Christian view’ for British Birds. (September 2017). Barbara’s poems have appeared in a variety of publications including The Herald (Glasgow), The Eildon Tree, Southlight and Waterlife (Wildfowl & Wetlands Trust). Richard has studied Peregrines in SW Scotland and Greenland, and Corncrakes in the Outer Hebrides. He retired in 2007 after 20 years as a countryside ranger, chiefly responsible for the Southern Upland Way. Spring, summer and autumn months are now generally devoted to wildlife recording with Barbara in Dumfries & Galloway, mainly birds, moths and butterflies. Two trips to Mongolia together greatly expanded their knowledge of the birds of the northern hemisphere. During recent winters he has been gradually updating and revising Biographies for Birdwatchers, expanding its scope to include the Arabian Peninsula. He has co-authored three papers for Archives of Natural History on Charles Richard (2015), the Dupont brothers (2016) and the Parzudakis (2016). With Chris Rollie, he co-edited Jack Gordon’s Birds of Wigtownshire 1890–1935 (2016), based on Gordon’s unpublished manuscript and field notes.